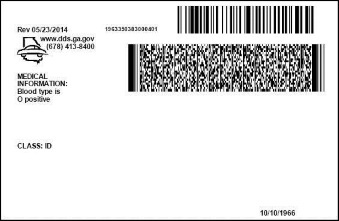 You may want to consider having your blood type printed on the back of your GA Driver's License (DL) and/or ID Card (ID) as it's a free/optional service offered at GA Department of Driver Services (DDS). In case of an emergency, this information is easily accessible on the back of your DL and could save your life! You must indicate on the application for issuance or renewal of DL or ID that you would like your blood type printed on the back of your permanent card. If you indicate yes, you will then be able to select your blood type. When your permanent license or ID is mailed to you, it will have your blood type printed on the back of the card under "Medical Information".